Being inspired can be hard at times, especially for those who are in charge of balancing between the art and science of enhancing the interiors in order to achieve a healthier and more aesthetically pleasing environment for the end user. Dream divisions are conceived by those able of planning researching and putting in real life their visions. The storytellers who write their biographies through fabrics, furniture and exquisite elements. 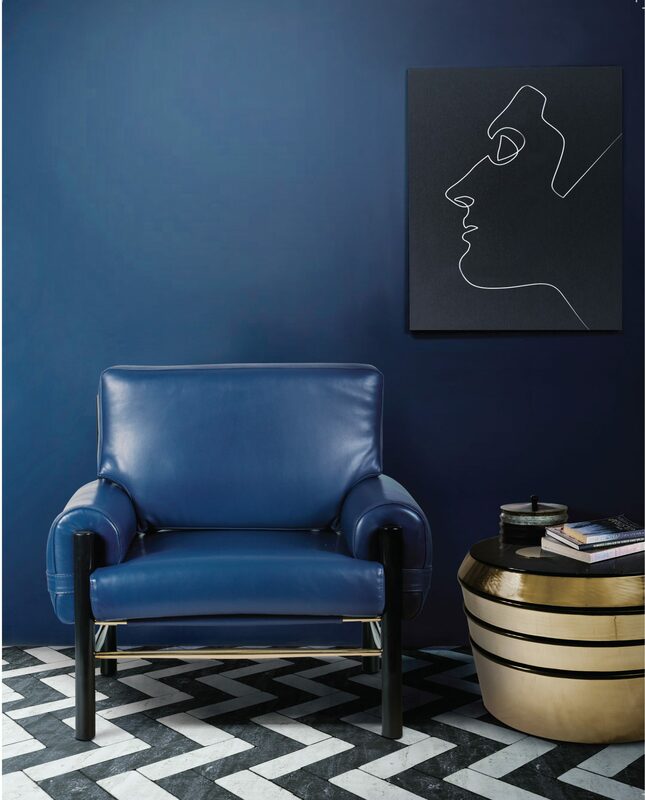 With a curated selection of the finest projects and materials Covet House brings Modern-Classic Inspirations for the perfect living room. Building the perfect Living Room design, is by far one of the hardest things when it comes to home decor. This is the room you will want to put more effort in to make sure it combines comfort and elegance. A comfortable living space is about layers, creating conversational seating, and building a sensible room that’s both visually and functionally stimulating. A perfect living room teases and pleases the eye in a manner that feels edgy and fun while simultaneously catering to one’s need to pile up or curl in in the most casual way. It’s the room you will introduce first to your guests and where you will spend more time in. Take into consideration your décor, your lifestyle and how frequently you will use the space when you’re planning a layout. The harmonious synthesis between innovation and tradition meets here in an exclusive and sophisticated gathering of the classic and modern design in dark tones. 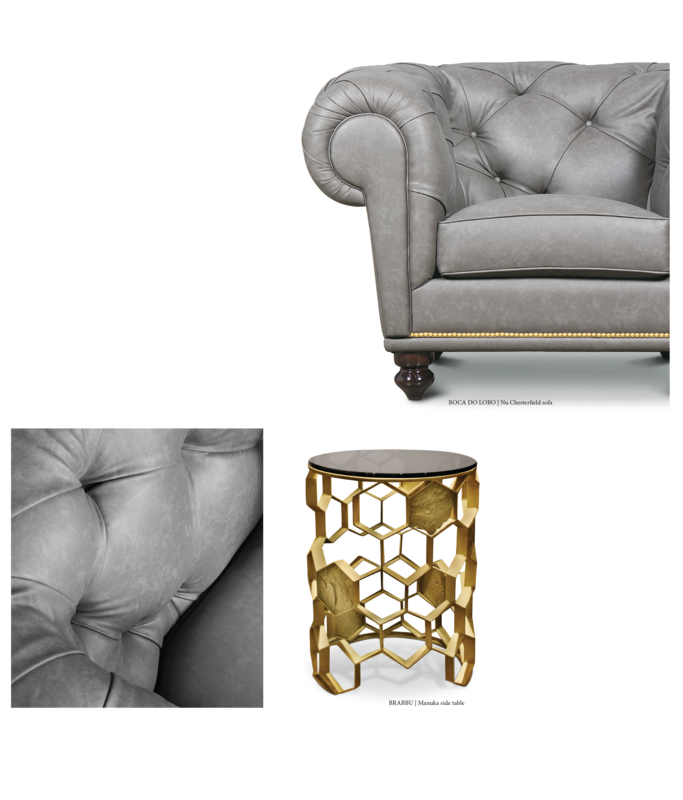 On the upper right side, there’s something intrinsically luxurious and old fashioned about the curved arms, the intricate details and the classic lines with a modern reinterpretation will make this piece a timeless decorative item. 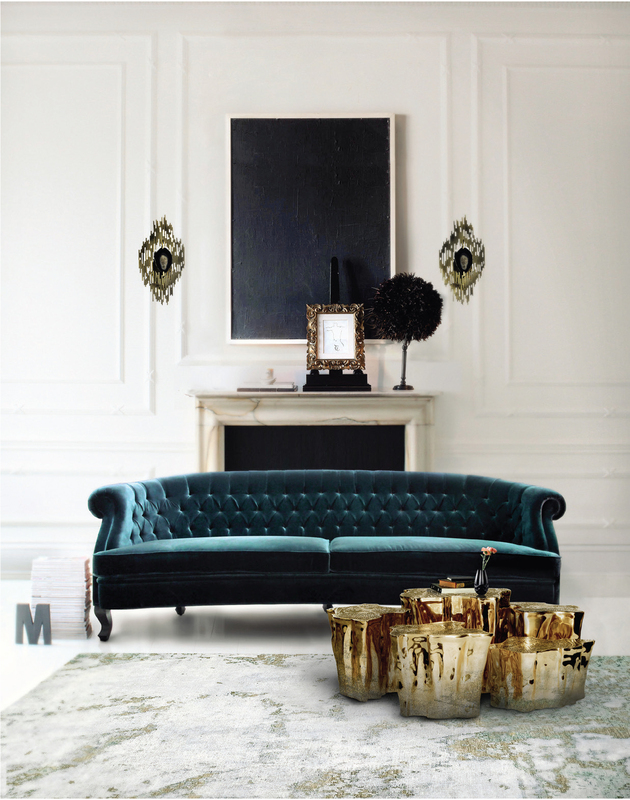 The NU chesterfield sofa is sure to endure for centuries to come, a confident piece of furniture to complement even the luxurious interiors. For complementing this extravagant armchair, a perfect side table influenced by the symbol of Japanese Culture. Koi table from Brabbu, as loved and affectioned as the carp is also a symbol of love and friendship which will be conveyed into a modern home decor. True classics never fail to make an impression and this is certainly the case for the Wave Center Table from Boca do Lobo mixed with the Sinatra’s standing lamp from Delightfull’s creation. Nowadays, the traditional coffee table is no longer the only way to decorate the living room; recently coffee tables are taking original shapes and designs that give the living room a whole unique look through unusual forms and new materials. With great style and elegance, it creates an exclusive ambiance to your modern interiors. The creativity and rich decoration of the Versailles Palace from Boca do Lobo, contributed to the inspiration of the creation of this exuberant sofa. 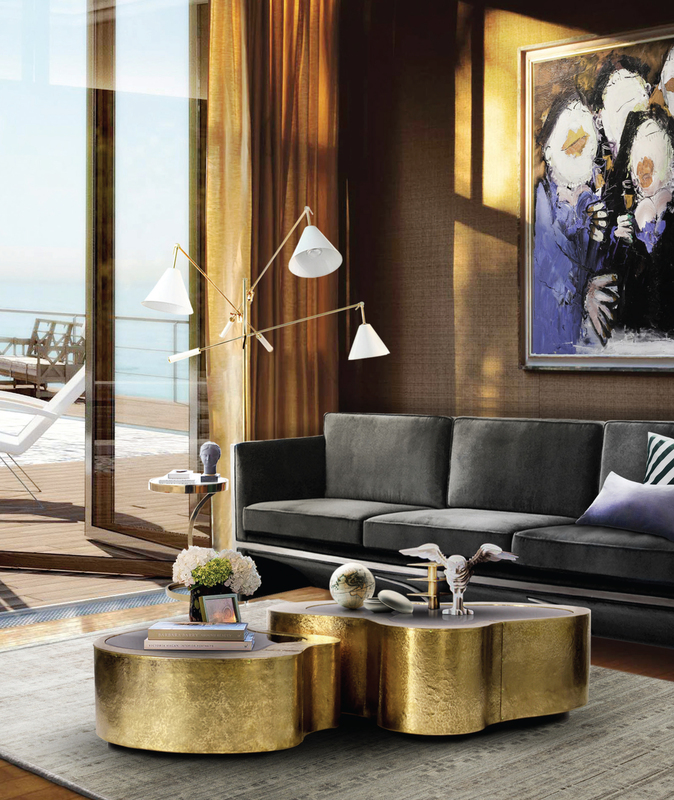 For the most demanding setting, a sculptural and versatile creation from Delightfull there’s the Sinatra’s floor lamp will be there while drinking a cocktail. 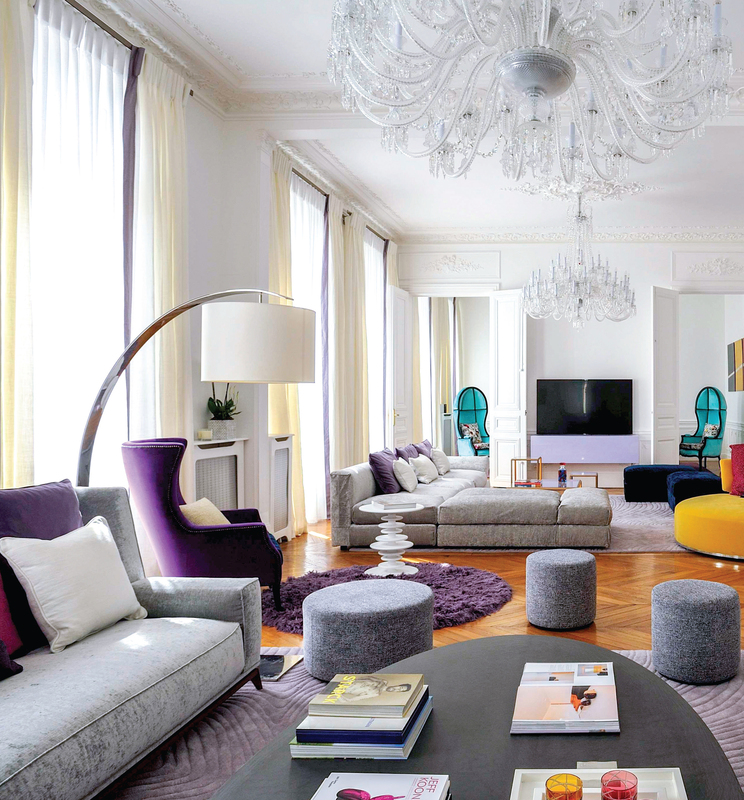 Elegant, lavish and stylish, is how one can describe the renovation of a Haussmann style apartment in Paris, signed by Patricia Mauguy Flores from PFBDesign. The renovation of this private residence had one main goal, and it was perfectly achieved: to enhance the majesty of the high ceilings and the ornating moldings given to the apartment with a creative symbiosis between luxury furniture and an eclectic color scheme. The color palette used in this division was based in a neutral background. This room is plenty of natural light, filtered by white and lilac curtains which give a greater height. This allowed the designer to go for a bold turquoise set of chairs and an audacious purple rug. The two grand chairs at both tops of the dining table NAMIB also from Brabbu, were custom made to perfectly match the room design. For highly contrasted living rooms with darker shades and design bold materials. This decoration has achieved a balance with a center table from Boca do Lobo, Then Monet Center Table made by natural elements, as well as artisan furniture making techniques. Combined with a modern luxury design piece, Newton Suspension lamp is a handcrafted piece that has something unique about it. Inspired by the aesthetic of this mid-century modern furniture piece, the Maree Sofa from Brabbu is a piece that reminds the rough landscape softened by uniform waves of the midnight. An exquisite sofa suitable in every modern or classic living room decor, bringing coziness and elegance to the set. In wide open, spacious rooms, it’s important to create different zones for more private and comfortable zones. 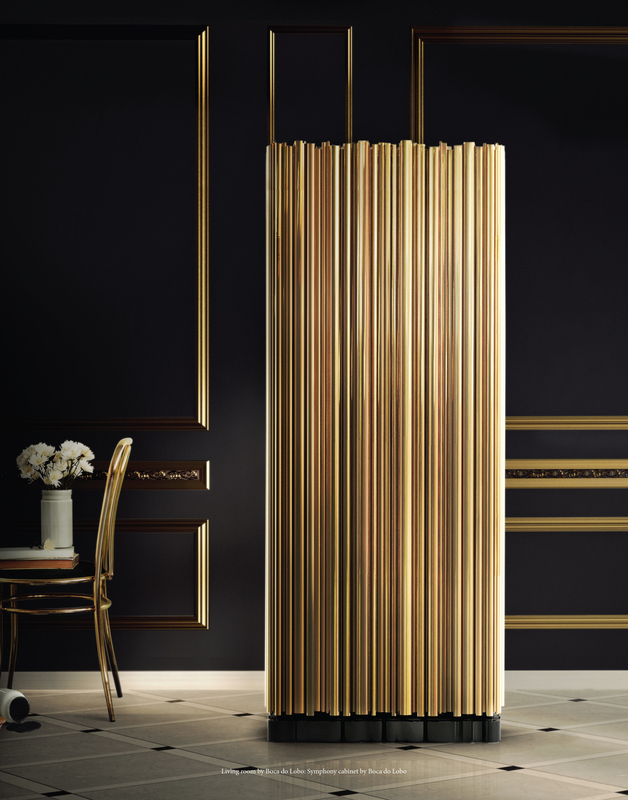 The Boca do Lobo Folding Screen is a possession of furniture with gold leafing symbolizes wealth and prosperity. It was a status symbol in those ancient times that inspired our present furniture makers who adopted the concept of gold leafing. A highly desirable statement piece that is jewelry for the home. 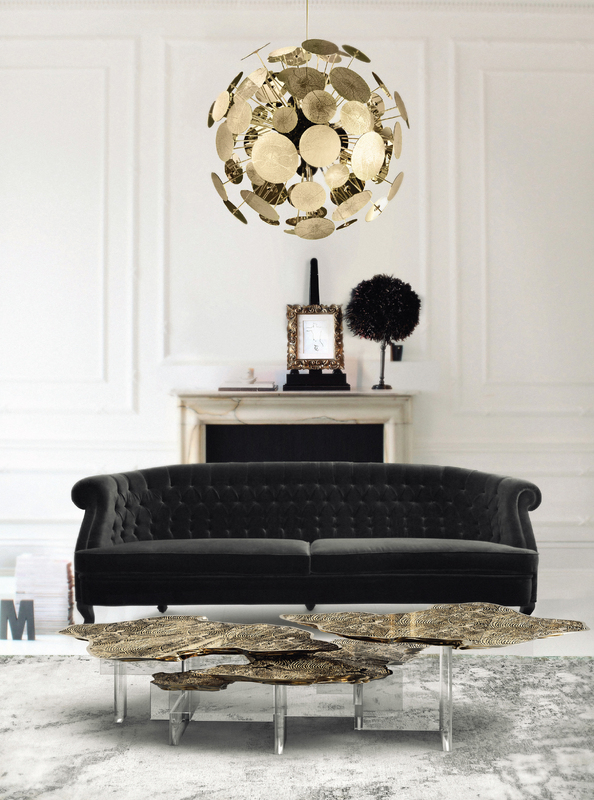 A luxurious light element, sets the mood to a slender ambience, suitable for modern living rooms with an attitude. The Waterfall wall lamp, from Luxxu is a creation that represents a natural sensation of waterfalls. 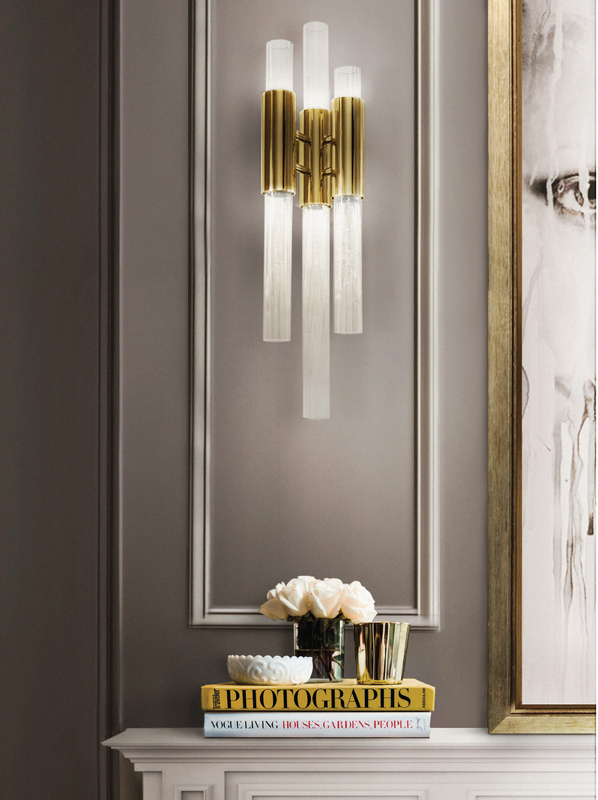 An elegant and modern wall lighting made of gold plated brass and handmade crystal glass tubes.